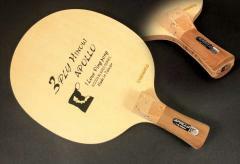 The woods has more hardness, unless the user's PRO-level use of the hard sponge (more difficult to control the ball sense), with a soft selection of 2.0mm rubber, [two-side Driver] using the European cake soft sponge series], [fast attack with the arc ] Use the China and Japanese soft sponge series. ※[ RL Thin] near-far distance of the arc driver. The grip is short and the center of gravity is moved forward. The strength of the arc driver is increased. It is suitable for the two-sided arc attack. It focuses on rotation and control, so it is slightly soft. if use the soft rubber can improve the control. ※[ CL Thick] near-far attack + two-sided arc driver, the grip is short and the grip is more solid and the center of gravity is biased, and the near-hand control is more precise. It is very suitable for pulling the arc to focus on the speed of rotation, suitable for both sides of attack/arc driver player. Special planning production, and strengthen the stencil texture of the stencil structure to solve the shortcomings of the cypress board easy to split the board, but also to enhance the performance of the plate to enjoy such as cypress veneer clean and neat hitting pleasure, the middle of the use of American cypress high hardness , High elasticity, thickening of the surface material Japan Kiso hinoki soft shell shock absorber, near the fast break of the excellent weapons, pull the arc fast, ruthless, accurate, high CP quality racket.